But 1.4 million UK homes and offices – or 5% of properties – remain unable to sign up for broadband speeds over 10 Mbit/s, the speed required to meet a typical household’s digital needs. This is down from around 2.4 million, or 8%, last year. The findings are part of Ofcom’s Connected Nations 2016 report – an in-depth look at the state of the UK’s telecoms and wireless networks. This year’s report shows good progress on the availability and take-up of communications services, which are crucial to people’s personal and working lives. However, the report finds there is much more to do – particularly in boosting mobile and broadband coverage, and improving the quality of service provided by telecoms companies. For example, rural areas still lag behind on broadband. Around a quarter of properties in rural areas – nearly 920,000 – cannot receive a connection of over 10 Mbit/s, often because they are situated a long way from the telephone exchange or local street cabinet. 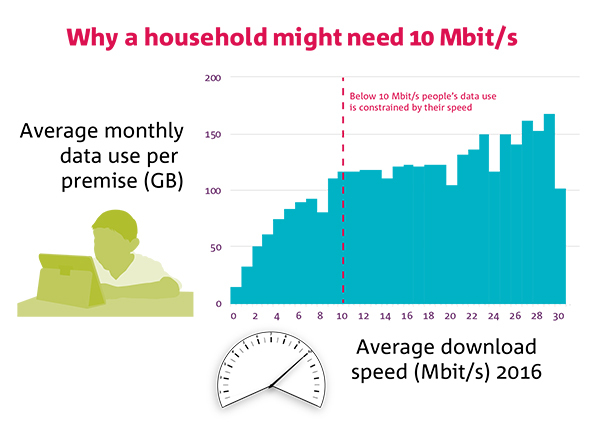 To help close this speed gap, Ofcom has today set out its technical advice for the UK Government on implementing its plans for universal broadband. “Mobile and broadband coverage continued to grow this year, but too many people and businesses are still struggling for a good service. We think that is unacceptable. As part of this, we have scoped three potential scenarios – standard broadband offering a 10 Mbit/s download speed; a more highly specified version of this service, including a 1Mbit/s upload speed; and a superfast broadband service. Government has said its preference is for the universal service to be funded by industry. Under this model, the companies providing the universal service would recover any unfair cost burden from a fund paid into by a range of telecoms companies. The coverage and quality of broadband across the UK has increased significantly over the past year, the Connected Nations report finds. Almost a third of homes (31%, or 9.1 million) have now chosen to take up superfast broadband – a download speed of 30 Mbit/s or more – up from one in four (27%, or around 8 million homes) a year earlier. Superfast broadband is now available to nine in ten UK homes small businesses (89%, or 25.5 million), up from 83% last year. This has been driven by BT upgrading its network; Virgin Media converting more homes to faster packages; ‘alternative’ fibre only networks such as CityFibre, Hyperoptic and Gigaclear; and the Government’s on-going Broadband Delivery UK programme. Superfast services are now available to 80% of small and medium sized enterprises or SMEs (almost 1.9m) – up from 68% in 2015. However, 15%of the UK’s SMEs are in concentrated areas such as business parks – of which 36% do not have superfast speeds, and 11% cannot receive 10 Mbit/s. Seven in ten premises (72%) can now receive an 4G mobile signal indoors from all four networks, up from just 28% last year, as operators continue to roll out faster mobile broadband. Ofcom rules mean that O2 must deliver a mobile data service to 98% of UK premises by the end of next year, and other operators are expected to follow in order to remain competitive. However, availability across the UK’s landmass remains low. Many people in rural areas, and those travelling by car and train, suffer from poor mobile signals. ‘Total’ geographic 4G coverage, where a signal is available from all four operators, is available in just 40% of the UK landmass – though this is up from 8% in 2015. For voice calls, one third (34%) of the UK’s geography does not provide a signal from all four operators, an improvement on last year’s 42%. This will improve further following an agreement between the Government and all major operators to achieve better geographic coverage of voice services by the end of 2017. Mobile phone users increasingly need coverage everywhere, so Ofcom is examining how regulation can help make that happen, and has called on network operators to go beyond current targets by exploring options for reaching areas without premises – such as transport lines and remote locations. Ofcom has also published its International Communications Market Report 2016, which compares communications services in up to 19 major countries. However, Ofcom remains concerned that the UK has very low coverage of ‘full fibre’ broadband, where cable and fibre lines connect directly to homes and offices. Here the UK ranks seventeenth out of 19 countries. To address this, Ofcom is requiring BT to allow other providers to use its infrastructure to build their own fibre networks, directly to premises.